Indian handlooms are revered across the globe – for their abundance, versatility and quality. Our skilled craftsmen have forever been associated with impeccable weaves, rich threadwork and remarkable textiles – be it florals, patchwork or animal prints, they are trailblazers in pouring out their imagination on fabric. Talking about animal prints and floral impressions on fabric, Kalamkari artwork deserves a special introduction: It’s an ancient Indian artform done on cotton or silk fabric using a pen, dipped in natural colors. The term Kalamkari in Persian stands for ‘the art of drawing with a pen’, where Kalam means pen and Kari means artwork. 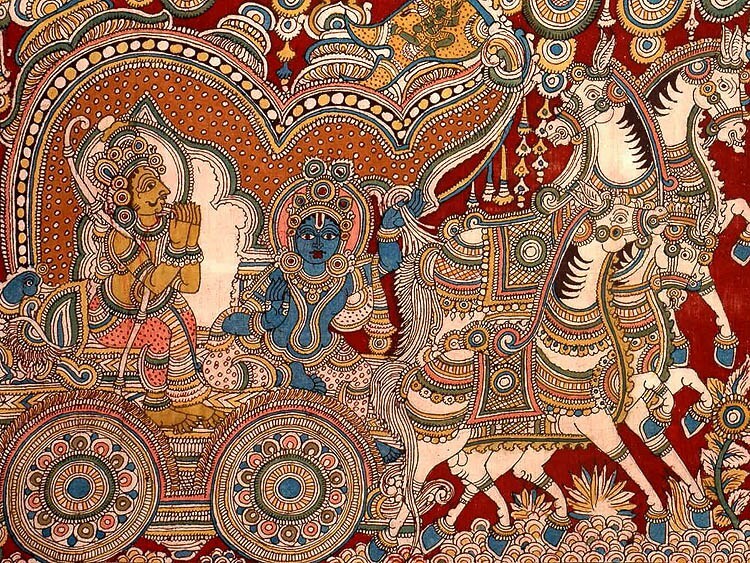 Peacock, paisleys, flowers and divine characters from Hindu epics like Mahabharata and Ramayana: are the key motifs that spans Kalamkari paintings, and the richness and intricacies of the craft are spellbinding. Some 3000 years ago, artists and painters used to move from one part of the country depicting scenes from Hindu mythology – they hand-painted the narratives on cotton fabrics using natural colors, developed from natural extracts. However, it was the Mughals who appreciated this style of painting and promoted Kalamkari art in the provinces of Golconda and Coromandel. The process of creating Kalamkari is slow and tedious. It involves 23 steps: wherein each step requires optimum precision and an eye for detailing. Earthy colors, such as Indigo, Rust, Black, Mustard and Green are used as primary colors, extracted from plant sources with zero chemical and artificial processes. For example, the black color is extracted from mixing water, jiggery and iron filings, while red and yellow are derived from the bark of madder and boiling pomegranate peels. Similarly, blue is extracted from indigo. Influenced by Persian styles and designs, Machilipatnam Kalamkari is a standing ode to the glorious Muslim rule in India. The principal motifs are conventionally printed with hand-carved ancient blocks, while intricate detailing is painted by hands using the pen. This particular style of Kalamkari painting draws inspiration from Hindu mythology, depicting beautiful scenes from the epics and folklores of ancient India. Originating from the temples, this style is high on religious elements, containing images of Gods and Heroes. Developed and nurtured in the region of Thanjavur during the flourishing Maratha rule, Karrupur Kalamkari work further accentuates the beauty of gold brocade on woven fabric of the royals. Such rich embellishments were found on the royal attires, especially on sarees and dhotis during the periods of Raja Sarfoji and Raja Shivaji. From passing off as religious paintings of Hindu gods in ancient India to gaining accolades during Mughal rule and making Andhra Pradesh, the melting pot of artsy craftsmanship, the beguiling Kalamkari artwork has indeed come a long way. Though in the last decade it was losing its prominence but ace fashion designers in joint collaboration with the state have now come together to revive the art. The art has expanded to incorporate freehand abstracts and in-detailed floral and animal prints that were once banally created by artists for over months, even years. MyRoots.desi is a devout admirer of this vibrant artform; peruse over their rich collection of Kalamkari desi sarees online and soak in the luxuries of the most ancient form of Indian art!